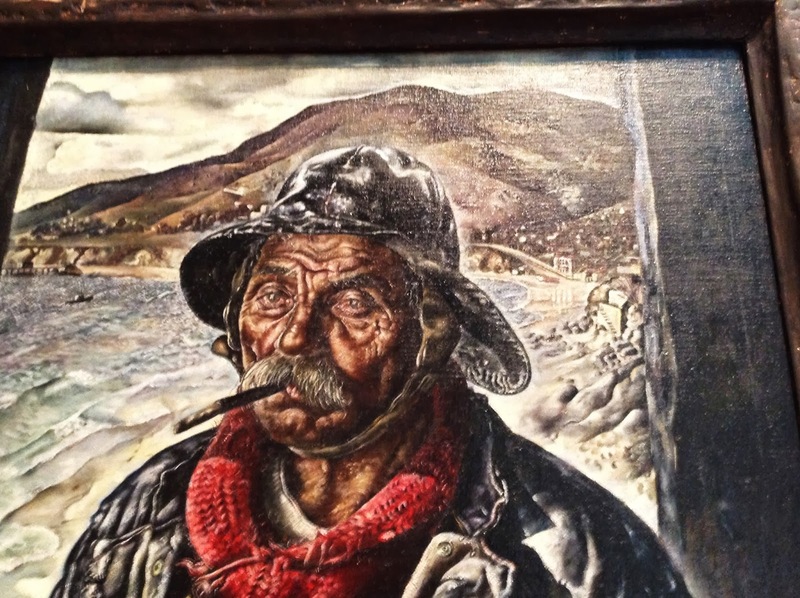 The title of this painting I beheld in the Art Institute of Chicago may have well be the beginning of a poem that could speak to the depths of one’s traveled soul. 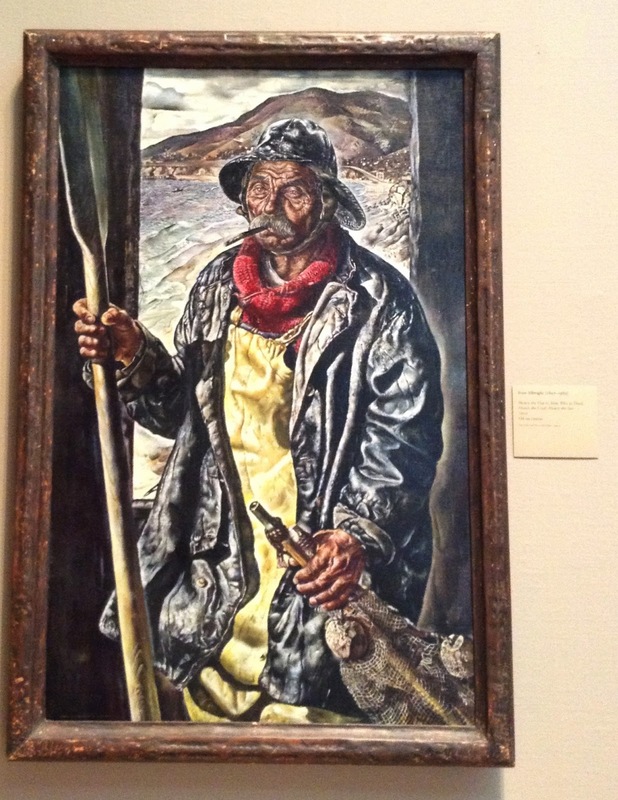 Ivan Albright was the artist and his poignancy went far beyond the subject of this painting. What better model than a fisherman when describing the weathering, deterioration, and dedication that hard work can toil on one’s form? I remember being drawn closer and closer to this large piece of life; peering so closely that it seemed as if I could touch this man’s face and feel the wrinkles. I could see the exhaustion in his eyes, mixed with determination, will, experiences, fears, triumph and wisdom. And I could see the release. The understanding that that which comes to an end – must. Ends are unavoidable. Yet so are the journeys to get there. I could labor on and on, unpacking symbolism and depth, but I believe each can do that for himself or herself. I know what the painting provokes in me. And I am speechlessly incapable of describing how thankful I am for art, for artist, for creativity, for thought, and for sharing of it all with others. It’s the sharing that I’m not great at. I share some things: time, resources one might benefit from, energy, compassion, empathy, the ability to hear and listen when given the honor to do so. But sharing from self, about self – not a strength. If you want my opinion on a third party issue, or even on people in general (motivations, experiences, etc), then I can oblige without too much difficulty. Yet if you are asking for explanations for why I am what I am…I won’t be able to help so easily. It takes time for me to process my own thought for even my own personal audience. And if one or both of those is absent, non-existent, or lacking in availability – then it stunts and suffocates and I can become my own glassy-eyed, weathered version of a weary traveler. I want to improve on sharing. I know these types are just as important as the others. And I know I am not alone in these inabilities to master such unveiled opportunities. Every moment of breath is an occasion for growth. I feel it. I am being turned over carefully each day. Being checked for cracks and tears. I am mended and stretched and discovered. I am shown what whole looks like. I am promised to be thus. Each time I am splashed anew in waves crashing, I can see it not as a reason to fear, but a time to be washed. To begin again. To see where I was parched, to wipe the grime away. To refresh. In these recent times, I am pushed to finally find boundaries. Personal limitations that are supposed to be heard, to be acknowledged. Pushed not in a forceful sense, rather in a loving nudge. I am understanding that it is okay to find a real time where “no” is needed and to trust that those who love me and want to see me flourish will forgive me of these times, and come to even encourage them – even at the expense of inconveniencing them or disappointing others. Those two words slice my insides like a sword. There are few things I abhor more than letting others down. It might by one of my worst fears. But that too needs adjusting. And there are many layers to that of which I am aware, and working on understanding as well. I am indebted to those who are already in my corner. Validating these steps at growth. Forgiving the adjustments. Giving us all time to get used to change. And above all, loving me through the labor, through the heavy seas. Shai " Our Gift from God"
Thank you for being so supportive. Seriously. Thank you. Mary Kathryn…seriously. Sister. Thank you so truly.